A big part of playing in the Disney Parks is eating in the parks, too. It’s important to know where and what to eat so you can relax and enjoy your meal; or eat on the run and quickly get back to the fun. Here’s where to find food that fits your needs in the Africa section of Disney’s Animal Kingdom. Eating and drinking can easily make or break your experience when during a trip to a theme park; and Disney’s Animal Kingdom is no exception. As a runner, there are times when I look at food as fuel and want only healthy eats to keep my body moving; and, of course there’s times when I’m operating in full vacation mode and looking to splurge on treats. Either way the folks at Disney have you covered with a wide-variety of food and drinks to satisfy most ages and tastes. 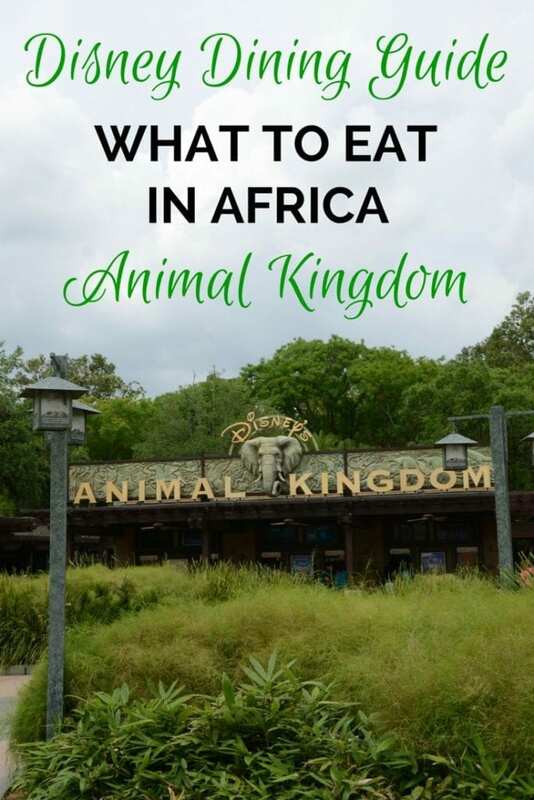 There are five places place to find food and drinks in Africa listed on the Animal Kingdom Guide Map plus a few food carts are in Africa, too. You can find food types, prices and more details about the restaurants – the Dawa Bar, Tusker House Restaurant, Kusafiri Coffee Shop & Bakery, Haramabe Fruit Market and Tamu Tamu Refreshments – on the guide, the Disney website, or the MyDisneyExperience mobile app. While all these food spots are nestled fairly close together, I’ve compiled a few helpful hints to make it easier to find what you want. The Haramabe Fruit Market is packed with plenty of healthy snacks including fresh fruit like apples, bananas, oranges and watermelon. The cart, hosted by Ocean Spray Craisins brand, stocks plenty of dried cranberries, and fruit and nut trail mix; and also sells yogurt. If you’re looking for something to drink other than soda this is your spot. They sell water, smartwater, vitaminwater, POWERade and other fruit juices. Animal Kingdom is one of the three parks that sells adult beverages – Be Our Guest Restaurant is the only place in Magic Kingdom that serves a limited selection of beer and wine. Not only does Animal Kingdom sell a variety of beer, they have Tusker Beer, an authentic African beer I enjoyed during my recent trip to Kenya. If you prefer liquor you can get a nice variety of cocktails and mixed drinks at the Dawa Bar. Also, for all the Disney Dole Whip fans Tamu Tamu whips them up with a little extra kick – your choice of coconut or dark rum on the bottom. The Dawa Bar and Tusker House both have seating areas. The Tusker House is buffet service and also features character dining – Donald’s Dining Safari Breakfast and Lunch. It has American and African cuisine and is a safe bet with little ones or picky eaters. There are three carts in Africa where you can buy a quick drink or snack. The Haramabe Fruit Market is also a good choice for grabbing something fast – especially if you’re getting ready to do Kilimanjaro Safaris or the Pangani Forest Exploration Trail as it’s the closest food option to both attractions. The Kusafiri Coffee Shop & Bakery is an obvious choice for coffee enthusiasts with espressos, cappuccinos, iced coffee and iced coffee with Amarula Cream Liqueur on the menu. You can also find some fun sweet treats including cupcakes decorated like safari animals. If you’re in the mood for some African cuisine window service at Tamu Tamu is where you can pick up a quick dish like chicken or vegetarian curry over jasmine rice. The Tusker House also keeps African dishes on the menu like Saffron-infused Root Vegetables and Cabbage, Cape Malay Curry Chicken, and Seafood Stew with Tamarind BBQ Sauce. Those with food allergies have several food options in Africa, too. Disney is trying to make it as easy as possible for you to enjoy eating safely and seamlessly with your family. Shortly after entering the park – and without asking for any special information – I easily spotted an allergy dining tips sign and a food kiosk with a variety of snacks and drinks including fruit, gluten free cupcakes and even gluten free beer. It was visible, labeled and well stocked with several recognizable brands like Udi’s.